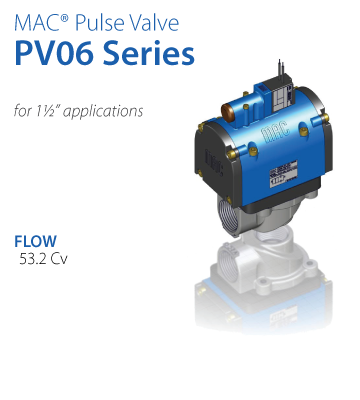 The MAC Pulse Valve utilizes the MAC 46 Lifting series’ balanced pilot technology to ensure fast, repeatable pulses. 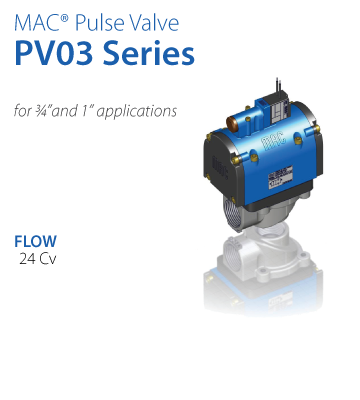 It also utilizes bonded spool technology in the main valve for superior reliability beyond existing diaphragm technology. A checked accumulator and a main spool with memory spring are used to ensure a shift back to the home position, for times when air supply may not be adequate. A line of adapter plates has also been released to replace existing diaphragm pulse valves with a direct drop-in, without disturbing existing plumbing. It is currently available in three sizes. 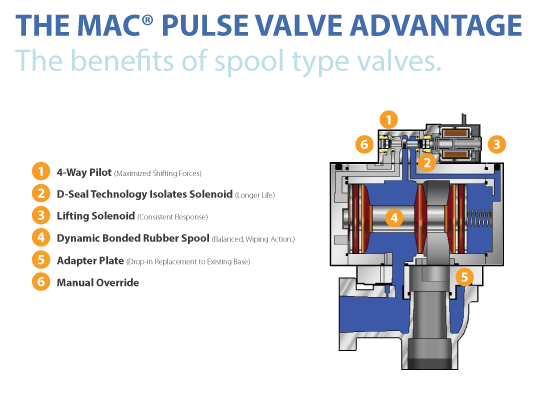 MAC® spool valves do not leak or experience blowouts. ROI is very short due to significant energy savings, extended bag life, greatly reduced replacement costs, reduction in downtime and labor savings. An aluminum die-cast body, nitrile seals and an environmentally protected solenoid are standard features. Viton® seals are also available for extreme temperature environments and chemical resistance. Dust collector systems are one of the largest consumers of air and energy in a factory environment. 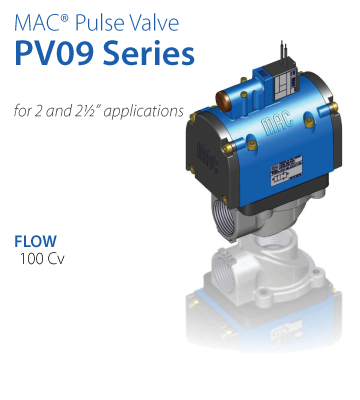 Energy savings for replacing diaphragm valves with a spool valve can be 20 – 30%. Diaphragm valves are rated at 1 million cycles, resulting in more frequent downtimes and higher labor costs compared to the 10 million cycle rate of a MAC® spool-type valve. 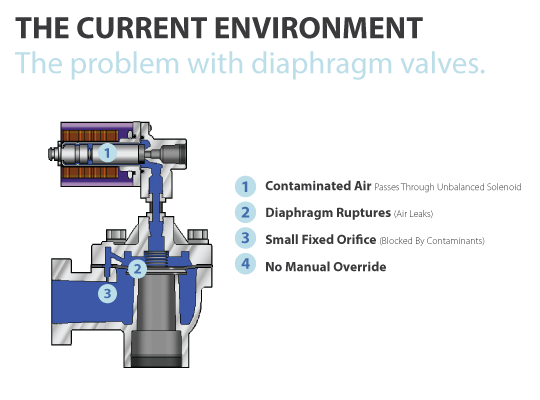 Many leaks in diaphragm valves occur after only a short time and are not easily detected. These leaks are caused by tears on the diaphragm. As a result, air compressors work much harder to supply the same air pressure, causing higher electricity usage. When diaphragm valves tear, they can cause negative performance in other air valves on the manifold.